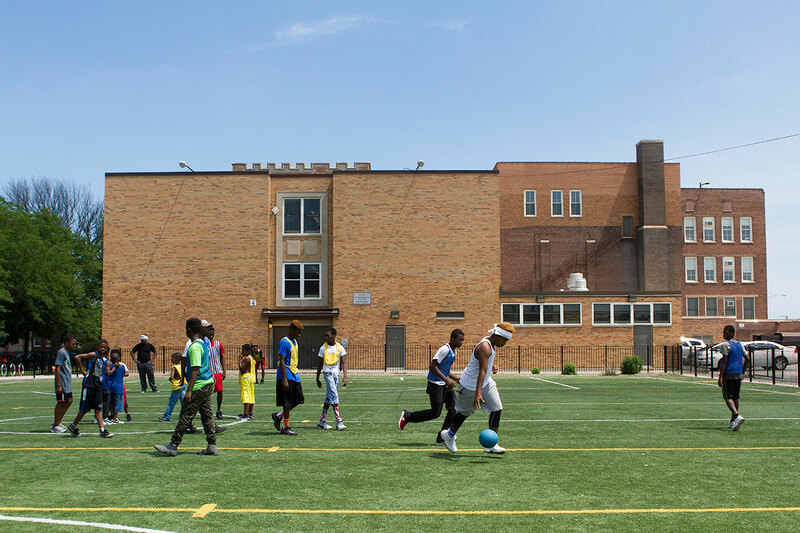 Boys from the nonprofit group Kidz Express play soccer on the field of George Leland Elementary School, a West Side public school. A few blocks away, the former Leland building was shuttered in 2013 and has been purchased as a new home for the group. When Doug Low walks into the dark gym inside the former Leland Elementary School in Austin, he imagines young people filling it, playing in a Friday night basketball league. In the classrooms, where insulation hangs through holes in the ceiling, he envisions a computer lab and activity spaces to give youth a safe haven from the tough neighborhood outside. Low’s vision is taking shape as the empty 1970s-era building is transformed into a new home for his nonprofit, Kidz Express. The group will also provide new services for adults, including free WiFi and help with applications for jobs and public benefits. Leland’s transformation is a rare success story: Austin and other black communities that bore the brunt of school closings in 2013 are stuck with the lion’s share of still-vacant buildings, adding another burden to neighborhoods already struggling with a legacy of disinvestment and segregation. The Chicago Reporter created this interactive map showing the stark contrast in socioeconomic conditions in neighborhoods with still-vacant buildings and in neighborhoods where buildings have sold. Citywide, only 14 of the 43 buildings left vacant after the closures have been sold or otherwise reused. Seven are up for sale. A Pew Charitable Trusts report foreshadowed the problem in its study of school closures nationwide, which have disproportionately hit poor communities of color. Pew found that among the hundreds of schools closed in 12 urban districts between 2005 and 2012, fewer than half had been sold, leased or repurposed. Low’s group, in fact, had to rely on help from a suburban River Forest church to buy the former Leland building. The church, Grace Lutheran, had for years sent volunteer tutors to Kidz Express and decided to target some of its tithing income to help the non-profit get a mortgage, said Logan Kruck, who oversees youth volunteers at Grace Lutheran. CPS officials admit that none of the $24 million raised through sales of schools thus far has been set aside for such a fund. Instead, the money was folded into the district’s overall capital budget, which pays for new construction and repair projects in existing schools across the city. Jim Capraro, a committee member and former long-time head of the Greater Southwest Development Corporation, said that the group’s recommendations have not been implemented the way the committee envisioned. Overall, he said, CPS hasn’t moved the repurposing process along quickly enough, leaving communities frustrated. By now, the mayoral committee envisioned, schools without a plan for reuse would be slated for demolition. But in several communities, the process, which was left in the hands of aldermen, remains stalled. The long-term consequences—including higher rates of crime near vacant properties, reduced home values in the surrounding area, and a reduced likelihood of future investment—can be devastating, according to Courtney Anderson, an assistant professor of law at Georgia State University. Anderson studied closures in Atlanta and Chicago (her former home) and detailed their impact in an article in the Journal of Gender, Social Policy & the Law. The consequences can “create a self-perpetuating cycle of population decline and diminished property tax revenue,” that can lead to more closures, Anderson wrote. The constant presence of an empty building can also take a psychological toll, she believes. “The mental health aspect, especially for children, is probably the most unique and most troubling,” Anderson said. Story by Kalyn Belsha. Interactive map produced by Matt Kiefer. Mayor Rahm Emanuel's decision to close 50 public schools in 2013 ignited a firestorm among parents, educators and community groups. Now, four years later, most of the schools are still empty. This series explores the aftermath of the mass closures on the South and West sides of Chicago.